Don't boys still have cooties in third grade? I was just cleaning out my church bag, and I found the notebook that Bria was drawing/writing in during Sacrament meeting this past Sunday. 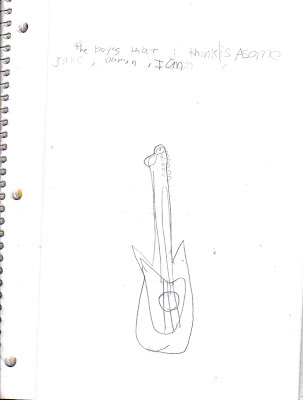 In case you can't read it, it says "The boys that I think is asome (awesome): Jake, Damin, Ian." Also, what is up with the guitar? She's very into "rock" lately, and is, of course heavily influenced by Hannah Montana/Miley Cyrus even though we don't even get the Disney Channel. Can somebody please stop time? She's growing up way too fast. And you're very welcome for that comment. That's really adorable. I remember my mom finding a list I'd made in my drawer when I was 8, and the title was, "How to Make Boys Like You". :) Among the around 10 things on the list? "Don't wear dresses." and "Be a tomboy." Wow! That actually is a really good drawing! Hehe. I'm not ready for the boy thing yet. Elizabeth (8) has assured me that she doesn't have a crush on anyone yet, but I'm not sure she'd tell me if she did. I remember crushing on boys in PRESCHOOL, so I can't rule it out. I can totally remember crushes as young as 4 too. Good luck!! Oh Ellie had a crush last year in Kindy. It's never to young.